The first example of 24 metre classic ship by the boatyard Mondomarine is called "Enneffe", a yacht with a semi-displacing hull entirely designed by Navirex, with classic very balanced external lines. 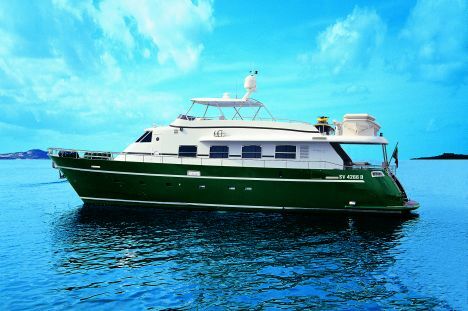 The 24 metre semi-displacing classic ship is offered as a compromise to meet various needs, thanks mainly to a maximum speed of 22 knots, combined with the typical volumes of this kind of ship. The choice of the boatyard to give this yacht an oversized engine means the owner can always use the engines at optimum rpm, with the plus of a considerable reserve of power at his disposal for bad weather conditions. Naturally this choice also means lower consumption in normal use conditions, as well as a reduction in wear and tear on the engines with consequent reduction in maintenance. The classic ship proposed by Mondomarine is equipped with accessories making handling easier, like for example, the stern thruster, or manoeuvring propeller in the bows, in addition to the classic bow thruster. Another very important accessory is the Transom Plate, capable of optimising the hydrodynamic performance of the hull, thus increasing the performance. The design develops over two decks plus fly bridge with pilot house on an intermediate level. 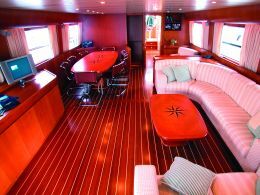 The lower deck houses the sleeping area where astern there is a roomy owner's suite with spacious bathroom, vanity unit, wardrobes and office corner. Forwards of this suite there are two guest cabins, one with twin beds and the other with a double bed, both with private bathroom. The area in the bows is reserved for the VIP cabin, with its own bathroom, plenty of space and a vanity unit. The crew's quarters are in the far bows, with private bathrooms and separate access. The main deck houses the lounge, divided into seating area and dining area, forward of which is a large service zone. On an intermediate deck between the main deck and the fly bridge there is the spacious navigating bridge, with numerous new generation electronic navigational aids. The fly bridge has an open air dining area and plenty of room reserved for sunbathing, as well as the outside control station forward, the tender and any jet skis astern. The semi-displacing 24 metre classic ship is ideal for those owners who intend to sail their boat themselves, able to rely on extremely easy handling and performance. For further information please contact: Mondomarine; Lungomare Matteotti 6; 17100 Savona (Italia); tel. +39 019828516; fax +39 019823418; website www.mondomarine.it; e mail campanellaspa@campanellaspa.com. Design, engineering, exterior and interior design: Navirex.